Above Board Chamber of Florida is proud to present the “Best of the Best” topics and panelists from the past year, featuring Lee County’s favorite professionals presented in a round table format from 11:30 a.m. to 1 p.m. Thursday, August 14 at the Landings, 4540 S. Landings Drive, Fort Myers. 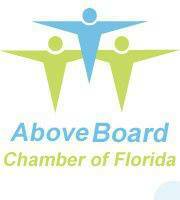 Each August, the Above Board Chamber of Florida invites members and guests back to learn more from their favorite panelists and topics. Attendees are encouraged to roll up their sleeves, ask the tough questions and join in on round table discussions about subjects relevant to today’s business practices. The chamber’s goal is to ensure its members have the educational opportunities and tools to operate the best businesses in Southwest Florida. Fort Myers lunch meeting sponsored by: Rebecca Ross, Vice President, Private Wealth Management, Robert W Baird & Co. Inc. Registration on or before August 8 will be $22 for members and $28 for friends. After August 8, registration will be $28 for members, $32 friends. Non-profits can put up a free table, and members can put up a table for $25. Attendees must RSVP. To register, visit www.aboveboardchamber.com.